A tremendous “Thank you!” goes out to the members of the Austin Working Group, whose efforts throughout 2015 have resulted in the digital resources published here as well as upcoming conference workshops and symposia. Together, we seek to grow the diceCT community and advance 3-D soft-tissue imaging well into the future. Thanks also to the National Science Foundation, The University of Texas at Austin, and UT CT Lab for their financial and institutional support. 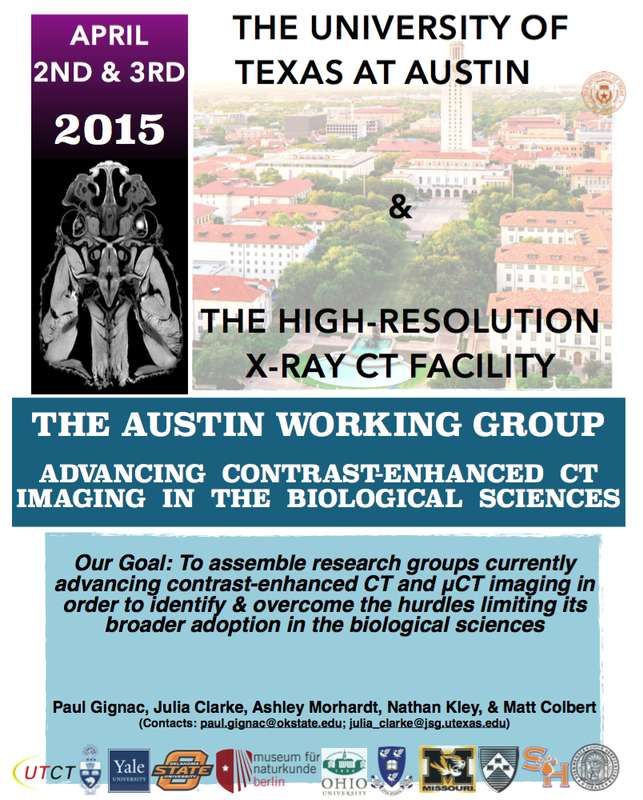 The Austin Working Group met for two days in April to discuss the state of the art for iodine-based contrast enhancement of X-ray μCT images. What emerged from that meeting was a set of standards and protocol recommendations as well as a strong desire to grow this nascent community.